Setting a world’s record is just one small goal of Plant Portsmouth slated for Aug. 18. The community group Friends of Portsmouth hopes to transform downtown blocks such as this one. 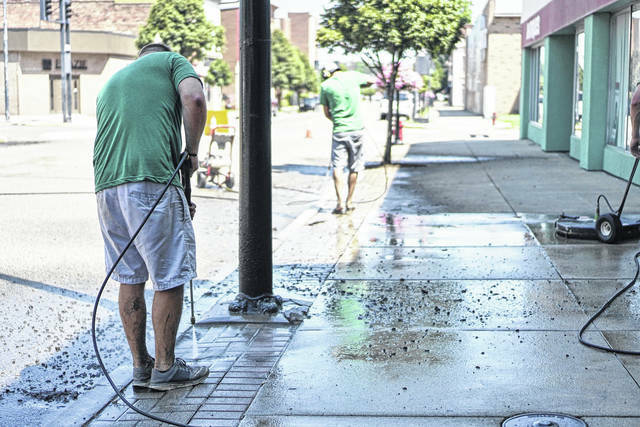 An unidentified volunteer power washes a street in downtown Portsmouth. Event organizers, The Friends of Portsmouth, have some “small” goals in mind for their “Plant Portsmouth” event scheduled for Aug. 18. “In one day, the image of our downtown will change immediately so we can start believing in ourselves again. Our downtown currently feels like it looks. Weeds, corrosion, and desolation,” event chairperson and local attorney, Jeremy Burnside said in a press release. While Portsmouth and its drug problems have been publicized in books, TV documentaries and other media, the most notorious pill mill is said to have closed over a decade ago. Despite that fact, surrounding Scioto County has one of the highest death rates due to overdoses in Ohio and the state itself has among the highest overdose rates in the country. Nevertheless, Burnside seems determined to help change Portsmouth’s image. In talking with the Daily Times, Burnside said his office puts together several community service projects each year. He said during one of those events he began to wonder what might happen if he could get a small army of volunteers, far more than the number he can wrangle from his office alone, to attack the appearance of downtown Portsmouth. 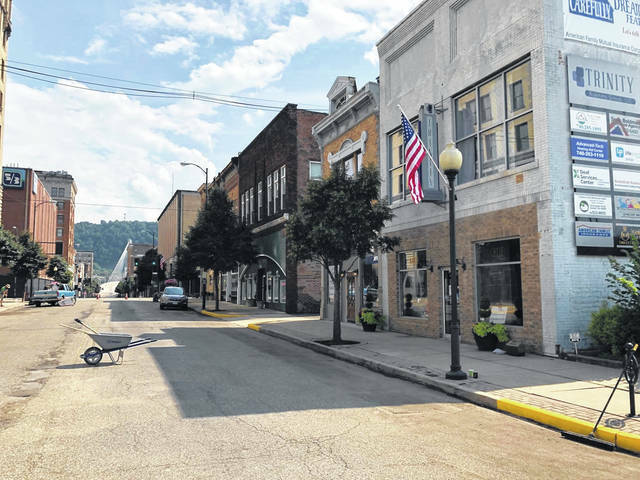 Concentrating on Chillicothe and Market streets, on Aug. 18, Burnside and the Friends of Portsmouth hope dozens of volunteers will be on hand to power wash all the brick pavers and concrete walkways lining those roadways, as well as paint light poles, street signs and curbs. Burnside further talked about hanging new U.S. flags from downtown light poles. Not really last and certainly not least, Plant Portsmouth organizers hope to break a world record for the greatest number of persons potting plants simultaneously. Burnside stated representatives of the Guinness Book of World Records will be on hand to witness the world record attempt. He said at least 500 plants will need to be potted. In their press release, Plant Portsmouth organizers bragged they have raised over $50,000 from various sponsors and hope to pull in as much as $100,000 prior to the event which is still a few weeks away. In addition to cleaning streets, hanging flags and planting plants, Burnside talked about the day including music and even a video shoot from home-grown music star Shane Runyan. Businesses downtown and in the Boneyfiddle area are expected to be open all day offering special deals to persons taking part in Plant Portsmouth. Acting Mayor Kevin Johnson and other local dignitaries will hand out awards that evening to the team that produces the cleanest street, to the hardest worker and others, Burnside said. Not incidentally, Burnside doesn’t want any momentum gained Aug. 18 to just fade away. The Friends of Portsmouth hope to establish what Burnside called an ambassador program downtown. He envisions volunteers wandering downtown and Boneyfiddle picking up trash and completing similar chores but probably more importantly acting as sort of tour guides for visitors and residents alike. Burnside wants the ambassadors to be able to point out places of interest in Portsmouth and be able to talk a bit about the town and its history. According to one observer, the efforts of Burnside and the Friends of Portsmouth are gaining some of the sought-after publicity. Portions of the press release put out by the Friends group were used in this story, but more importantly reportedly have appeared in major papers in other cities and states. The Friends of Portsmouth describe themselves as a non-profit organization for the betterment of Portsmouth, Ohio and the Greater Scioto County areas. https://www.portsmouth-dailytimes.com/wp-content/uploads/sites/28/2018/08/web1_LOGO1A.jpgSetting a world’s record is just one small goal of Plant Portsmouth slated for Aug. 18.
https://www.portsmouth-dailytimes.com/wp-content/uploads/sites/28/2018/08/web1_block1A.jpgThe community group Friends of Portsmouth hopes to transform downtown blocks such as this one. https://www.portsmouth-dailytimes.com/wp-content/uploads/sites/28/2018/08/web1_EmptyName-A.jpgAn unidentified volunteer power washes a street in downtown Portsmouth.